Impeccable-Captivating-Spacious describes this 3 bedroom 2 bath ranch home in a great Antigo northwest neighborhood. Home is complimented by an enclosed finished front porch, 6 panel doors throughout and consists of a master bedroom suite, 2 bedrooms, and a large living room with a built in ambient electric heat on/off fireplace on the main level. Lower level has a finished family room with a built in ambient electric heat on/off fireplace, 2 bonus rooms, separate laundry and an entry through the attached insulated 2 car garage. 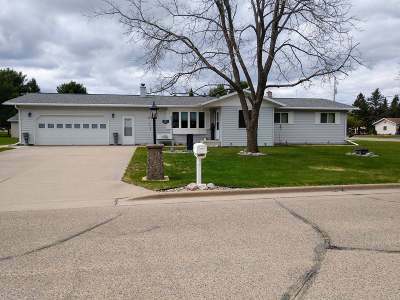 Additionally, there is a detached 2 car garage with a heated work shop and an 8x10 potting/garden shed within the fenced in rear portion of this well landscaped corner lot. The home has a newer roof, and a furnace and hot water heater that are only a year old. There is inlaid ceramic tile in the rear entry and kitchen/dinning areas. The home has keyless entry for peace of mind and security. This home is waiting for your arrival. Call us today for your viewing!